Grip work is something that is talked about quite a lot no matter what circle of athletes you surround yourself with – basketball players need it for ball handling, baseball players for everything they do on the field from swinging to throwing, football players for constantly using their hands, and hockey/field hockey/lacrosse players for the obvious reason that they use their hands to hold onto their sticks to play their respective games. So whenever an athlete comes into the gym, it is often understood right away that our modus operandi (M.O.) is to grip the crap out of whatever we are using in order to develop more musculature, and to not drop the weight in deadlifts, farmer walks, DB lunges, etc – and the list goes on. 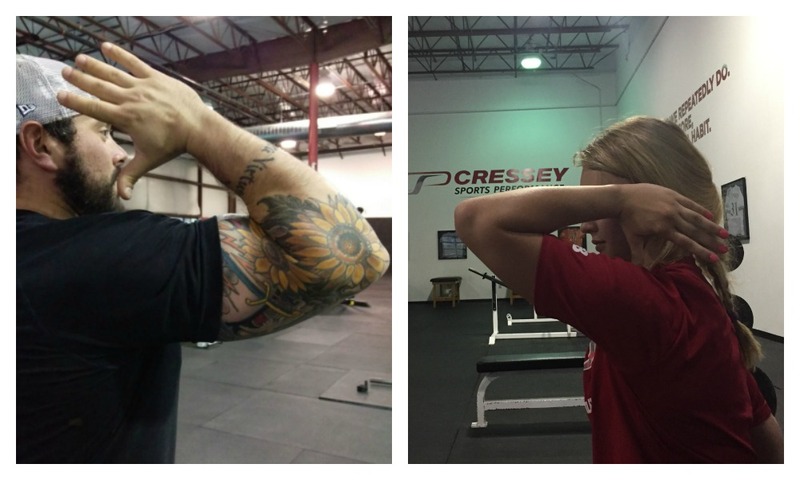 In fact, grip work is so important that one of our past interns at Cressey Sports Performance inspired several of the staff through his grip work and forearm routine after every lift, that we bought extra equipment in order to identify the best methods possible for improving our grip. It was a lot of fun for a few months. However, when it comes time to do some accessory work and use the cable machines, what should the approach be? Is there an optimal amount of tension necessary when working with cable machines with all the various attachments and handles? One thing I find with any client is that they are often unsure of the technique to use with any cable machine – sometimes they grip way too tight, and not enough motion occurs, or they don’t grip at all, and they leave weight that they could have rowed, chopped, and lifted on the machine because they lacked the intensity to get the point across. It’s gripped too light – so there is not enough tension in the body to get the job done. It’s just right – just enough tension, but not so much the purpose of the exercise is all in the arms, and not so light that it can’t be completed. With this in mind, I’ve made a video describing these items in a little more detail. Or, you are too tense through your hands and feet, instead of your hips and/or abdominals. Essentially, if your body is being tasked with the movement of performing a chopping or lifting motion (also D1 and D2 flexion/extension patterns) then your torso will need to stay “still” while your arms and appendages that are further away from the middle of your body will need to move about the axis of rotation. 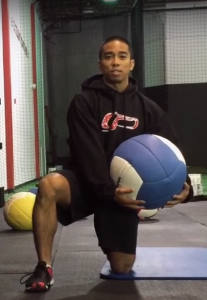 Half Kneeling MB Scoop Toss – a great display of D2 extension into D1 flexion. Now, take what happens if you were to do a half kneeling med ball scoop toss, for example. What happens if your arms are so stiff, but your torso is so gumby and unable to apply the correct timing and sequencing of the desired movement? Well some movement may occur – it might not be the correct one your coach (or yourself) desires. On the other hand, what occurs if you have super relaxed and whippy arms, and a stiff torso that doesn’t rotate? I’ll let you know that the bolded and italicized words are a hint that this is also not desirable from a movement perspective. You need both stiff and relaxed qualities – in fact you just need to own the timing mechanisms of how certain athletic movements occur, which is not as easy as it sounds! Now if you are moving with a bit more speed and athleticism, then as always, the answer to the question of what is right (for this movement) is … it depends! Side Note: I love using this cue of “squeezing” the handle, and then relaxing, as a way to “subconsciously” get someone to use their abdominals.